When I was a kid, my parents volunteered with their church group at a soup kitchen. My dad told me about families in our community that didn’t have enough to eat. A few years back, I helped serve Christmas dinner at St. Francis Lutheran Church and I was struck by the broad swathe of people who joined us – elderly, kids, young adults, pretty much everyone you see in your neighborhood. St Francis’ Sunday “coffee and donuts” bagged lunches for those in need get help from donations delivered by Food Runners. That was the first I’d heard of Food Runners, so I looked them up. Picking up leftovers from events and organizations and delivering to shelters who server up fresh, nutritious food at no cost to hungry people…a pretty simple, and great idea. So last November, I emailed Food Runners asking about volunteering. 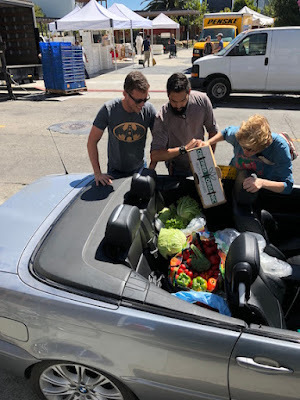 A few emails later, I was making my first pickup at Noe Valley Farmers’ Market – and I’ve been doing that run ever since. Market Manager Elizabeth and farmers load donations to Dennis's convertible. 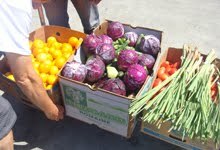 I arrive each Saturday as the stalls are being torn down and unsold fruits and vegetables are packed up for donation. Sometimes I leave with a couple of large bags of greens, carrots and broccoli. Other times, my convertible is overflowing with so much with fresh, organic produce…. passersby jokingly ask if I’m on a juice binge or if I knocked off a corner produce store. I laugh and tell them I’m delivering for Food Runners before the light turns green and I continue my delivery. All-in-all it only takes about 90 minutes of my Saturday afternoons but it really makes an impact on me and my friends who help out, on the farmers who really appreciate knowing their unsold fruits and vegetables are helping feed people and on servers who bring daily meals to our hungry community. 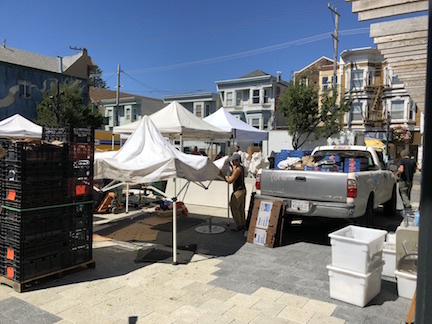 Noe Valley Farmers’ Market, whose donations benefit the Mission Free Farm Stand, is just one of many farmers’ markets who gather up fresh fruits and vegetables for Food Runners. Some of the others include: the Fillmore Farmer's Market, the Divisadero Farmers’ Markets, the Fort Mason Farmers’ Market whose donations support the Veterans Academy, with subsidized housing for 100 US veterans. And, the San Francisco Ferry Plaza Farmers’ Market, where volunteers Keith, Seth and Frank have been doing their weekend run for the last 25 years. In the Food Runners truck, they make deliveries to four different shelters every week. Often picking up as much as 1,000 pounds of fresh produce during summer high season. All of which gets delivered to San Franciscans in need. I’m glad to be a small part of such a great group of people who know what a little food can mean to our hungry neighbors.